ARE THEY MEETING TODAY'S CHALLENGES? 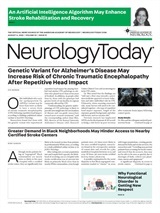 Last month, Neurology Today discussed the changes in neurology residency programs that have resulted from new federal regulations limiting the working hours of all resident trainees and by the rapidly changing US economic and legal climates. This month, Neurology Today interviewed experts on changes in the actual training of residents triggered by new requirements from the Accreditation Council for Graduate Medical Education (ACGME). Prior to about 1990, neurology had limited formal super-specialization. Most neurologists in practice were trained to diagnose and treat the full spectrum of disease and to include in their armamentarium the performance and interpretation of EEGs, EMGs, and evoked potentials. The majority of neurology training programs included exposure to all these areas through inpatient rotations and outpatient clinics. How have things changed since then? John Corboy, MD, Associate Professor of Neurology, Director of the University of Colorado MS Center in Denver, and Chairperson of the AAN Graduate Education Subcommittee, has served as a program director for adult neurology for seven years. “A major influence has been the ACGME introduction of the six core competencies, including patient care and medical knowledge – the ‘basics’ – but now also including professionalism (and ethics), communication skills, practice-based learning, and systems-based practice,” he said. “Through the AAN committee, we are trying to develop ways in which programs can teach and assess these less concrete topics,” he added. Neurology subspecialty material has increased considerably over the past decade and program directors now face the daunting task of imparting a substantial clinical education to their residents. Steven L. Galetta, MD, Director of the Division of Neuro-Ophthalmology of the Department of Neurology and recipient of the 2004 American Neurological Association Distinguished Neurology Teacher Award, has served as Director of Neurological Training at the University of Pennsylvania Medical Center in Philadelphia since 1989. To increase the residents' exposure to clinical material, the Penn neurology residency program formed outpatient rotations in neuro-ophthalmology, movement disorders, cognitive neurology, multiple sclerosis, stroke, epilepsy, neuro-oncology, and neuromuscular disease, and most residents spend some time in each rotation. In addition, they created an ambulatory-emergency rotation – a favorite among the residents – in which they see outpatients who need urgent attention. The Penn program has also made communication skills training a priority. The oral and written proficiencies of residents are evaluated by attendings, colleagues, nursing staff, and secretaries. They have instituted an oral examination in which each resident is formally observed while performing a history and examination on an outpatient; this is repeated during the subspecialty rotations on an informal basis several times. Another innovation at Penn is its patient-oriented research curriculum. The residents are taught principles of epidemiology, how to write a research proposal and a case report, and how to interpret the literature. The resident is exposed to different mentors ranging from those in practice or industry to those who conduct clinical or basic research. By the end of training, residents have chosen a mentor and made a formal clinical or basic research presentation before the entire faculty; many use this as a springboard to apply for external funding. “This has been an invaluable program for our residents, regardless of the career path they have chosen,” Dr. Galetta said. Justin C. McArthur, MBBS, MPH, Professor of Neurology and Epidemiology at Johns Hopkins University in Baltimore, MD, and Neurology Training Program Director there since 1996, has expanded his training program to meet current demands. “We have initiated a combined a six-year Neurology-Radiology-Neuroradiology program leading to triple certification in all three areas – with the aim of developing academic neurologists trained in imaging,” he said. The AAN Committee has developed a case-based curriculum that has been implemented by a number of neurology training programs in the US. Lori Ann Schuh, MD, Neurology Residency Program Director at Henry Ford Health System in Detroit, MI, was trying to figure out how to address the core curriculum requirements when she came across the AAN's Ethical Dimensions of Neurologic Practice: A Case-Based Curriculum for Neurology Residents. Examples of cases include: Truth-telling and Disclosure; Presymptomatic Genetic Testing; Persistent Vegetative State; Brain Death and Stopping Treatment; Physician-assisted Dying; Clinical Trials; Mistakes; and Professional Misconduct of a Sexual Nature. This course, held for one hour per week during a ten-week block, every three years, is offered to each neurology resident once during training. Other courses held on alternating years of training are End-of-life Palliative Care and Psychiatry. The Departments of Neurology at Johns Hopkins University and the University of Pennsylvania have partnered in an exchange program to offer a greater variety of educational opportunities for their residents. Dr. Ances, who plans to go on to a fellowship in Neuro-AIDS next year, took advantage of the program at Hopkins, which has a well-developed inpatient and outpatient service. “This rotation provided me with an invaluable experience,” he said. Faculty and house staff also meet once a year to discuss cases at Winterthur, an estate in Delaware located at a geographical mid-way point. NEUROLOGY RESIDENCY PROGRAMS: ARE THEY MEETING TODAY'S CHALLENGES?